So your baby has established breast feeding – and you enjoy the intimate time you spend with your baby while nursing. But then, you career won’t exactly wait for too long. Within a few months, which seem very short, your maternity leave is up – and you have to get back to work. But breast milk is like ‘liquid’ gold’ and extremely healthy for your baby. So at no cost should you stop lactating or giving your baby this ‘elixir’! 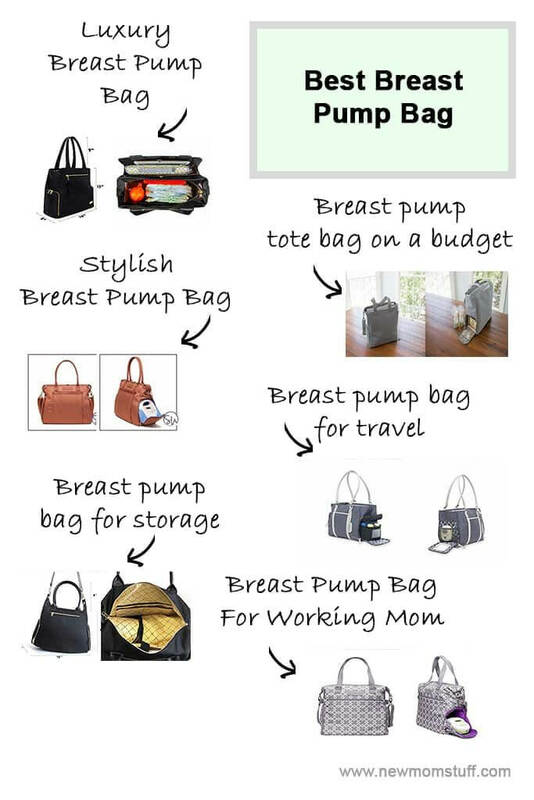 And to help you to achieve just that we have brought you these top picks for best breast pump bag. On an average, expect to pump about 8 times in a day – and you are likely to have to do it a few times while at work. And what do you do with the milk you produce then? You need to store it. And these bags actually also help to store the milk in a cool and hygienic atmosphere in addition to the pump. And that way – you can take your milk back to your baby at the end of the day! This New Yorker Breast Pump Bag by Charlie G comes up with double insulation system ands is durable.Check out its other features. Want to be fashionable without sacrificing functionality? 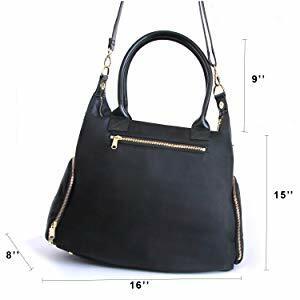 For lactating urbanite new mom the New Yorker Breast Pump Bag by Charlie G fits all their criteria of a functional and efficient yet luxurious bag. Apart from the spacious interior that can keep hold of important what-nots to fire up their professional dealings, it can also fit all type of portable breast pumps (like Medela , Spectra: S1, S2 or Dew) and coolers– stashed discreetly inside the lower side-slide compartments (compartment Size: 7″ x 7″ x 7″). Proven to keep cold milk safe for up to 6 hours with ice packs in its double insulated compartments, it’s truly a boon to working Moms. Great also as a diaper bag when baby is all grown up. To store, a dust bag is included. Sarah Wells Claire Breast Pump bag built for pumping mamas, by a pumping mama.Click here for more pictures. 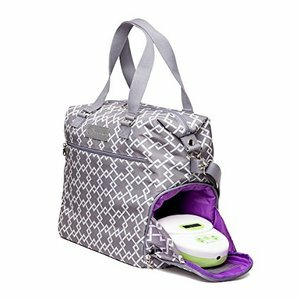 Sarah Wells Claire Pumping bag easily fits most portable-sized electric breast pumps.Find more details here. 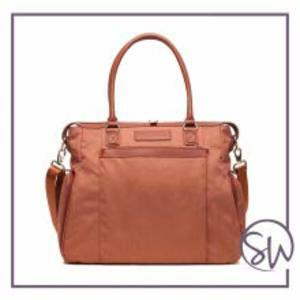 Designed to suit a breastfeeding Mom’s desire to be functional without sacrificing style, the Sarah Wells Claire Breast Pump Bag allows freedom to pump nutritional breast milk when on the go. 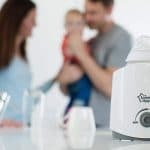 The side-slide compartment at the bottom fits all types of portable breast pumps and can store milk container in its therma-lined pockets without any hitch. You can choose from either black or brown and still enjoy the same portability and functionality to store and keep things safe. This one can also be used as a diaper bag later on. For bigger requirements, a Kelly Bag from Sarah Wells comes highly recommended. 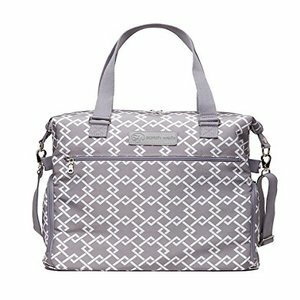 When money’s tight, the Dr. Brown’s Breast Pump Carryall Tote is just perfect for pumping WonderMoms. Sleek and stylish, durable and functional, it can fit a bottle cooler minibag and pump accessories. It’s compatible with all portable breast pumps and can also be converted into a diaper bag or gym bag when baby’s all grown up. 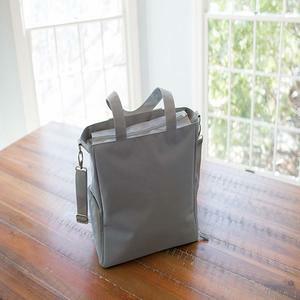 Designed with convenience in mind, it has zippered side pockets to hold other accessories. And yes, it can simply be wiped clean and does not require any additional stuff to do so. 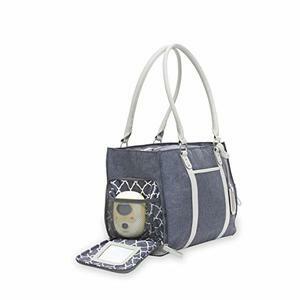 The Kaylaa Premium Breast Pump Bag is the ultimate answer to Mommies who tend to overpump. Built with 2 separated side-slide insulated compartments, it fits all types of portable breast pumps and can hold 2 milk coolers. Compartments are spill-resistant and can hold milk up to 6 hours max with an ice pack. Inner compartment are subdivided to allow easy organization of things. Straps are also ergonomically designed while overall exterior feel is not devoid of style. Ever experienced hopping on a plane only to find that all the milk you pumped had been checked in? 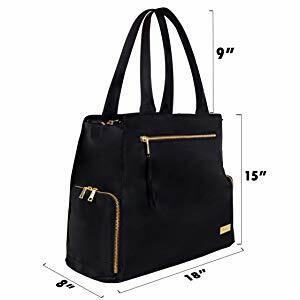 Fret-not, the BananaFish Charlotte Breast Pump Tote is designed to be hand-carried like any satchel do while allowing your child access to nutritious breast milk even when 7000 feet above the ground. Designed for traveling, it comes with a spacious interior with zippered pockets to store phone, charger, notepad and other thingamajig you brought along. 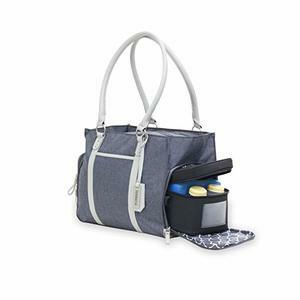 The insulated side-pockets can fit any normal-size portable breast pump and a cooler storage for pumped milk. With long shoulder traps, it can be easily slung while hopping from one destination to the next. Color choices in gray or black. 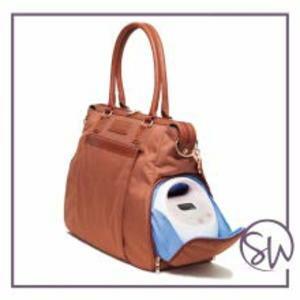 This Sarah Wells “Lizzy” Breast Pump Bag is quite spacious and large – allowing you to carry more than just breast pump and bottles! It can hold your Medela PISA, battery pack, flanges, and tubing in one compartment. After putting in all the accessory items you will still have space for your lunch box, water bottle and other work related items. 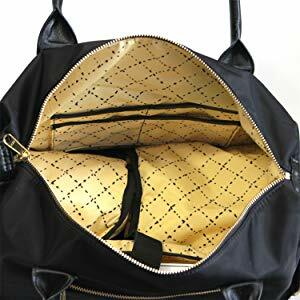 This bag too helps to conceal the breast pump even as you are using it. And the thermal insulation inside ensures that you can keep the milk cool. However, if you live in warmer climes, consider investing in some reusable ice packs, just to be on the safe side. Looks cute . Some moms even got complimented on the looks of the bag, including the contrasting purple lining inside! This is a 100 pack set of storage bags for breast milk and takes up very less space in your breast pump bag. Check the price here. This is actually a 100 pack set of storage bags for breast milk. Using them is simple – just tape them to your breast pump, where the bottles would normally go. They are clean and completely sterilized – ensuring that the milk is completely safe and uncontaminated. Also they will take up less space in your breast pump bag, so that you have more place left over for the rest of your stuff as well! Another advantage with these breastmilk storage bags is that they make storing the milk in the fridge easier. 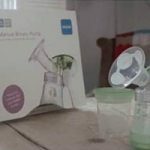 Even if you are freezing the milk, you can do it in these – but not in the bottles! Thawing them is also easier. Plus, they also have a special spout that makes pouring the milk out into the bottles very easy. These do not add any synthetic smell to the milk. They have a larger capacity than standard breast milk bags. They are made of completely BPA free plastic that is thick and leak proof. Once frozen, the milk in these bags is easier to stack up in the freezer. So if you are looking to buy some freezer safe breastmilk bags as well, then these are the best that money can buy! And with that you have it – not just breast pump bag – but we have also given you a very convenient bag option for storing breast milk in! So now, all you have to do is order these and be all ready for your baby! 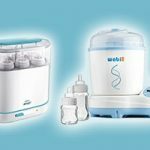 Philips AVENT Electric Sterilizer Vs. Wabi Baby Sterilizer: Which is the Best Bottle Sterilizer?